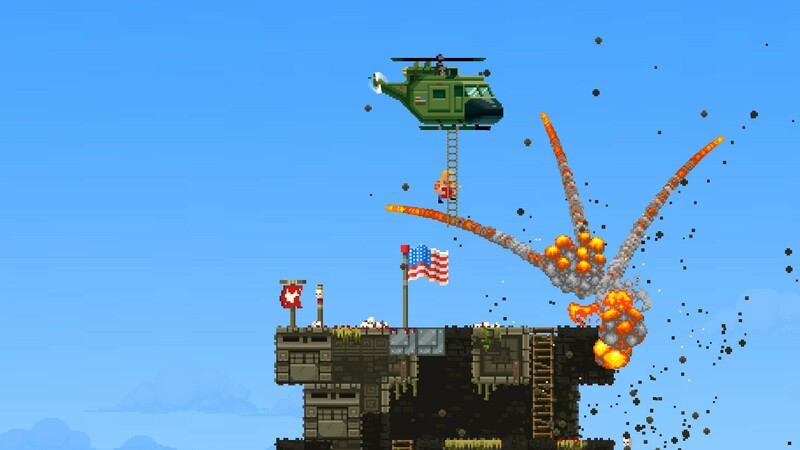 A short time before we headed off to PAX East, we were lucky enough to get our hands on a preview version of Broforce to try out. I really didn’t know what to expect from this game, but from the looks of it, it was going to be as close to Team America: The Video Game as I was likely to get. Then we got a chance to talk to them. Check it out! See, it’s ice to meet you because then it freeze frames. Now let’s see how the game played. 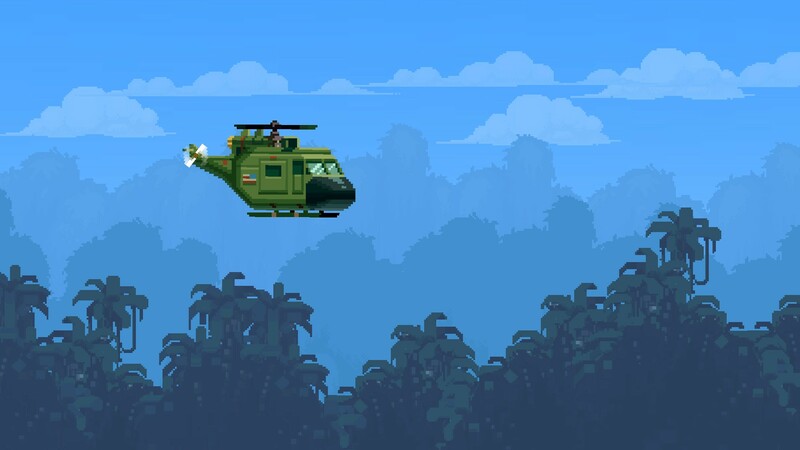 The Devs insist the explosions are timed and it is just a coincidence that you get to the helicopter JUST in time. 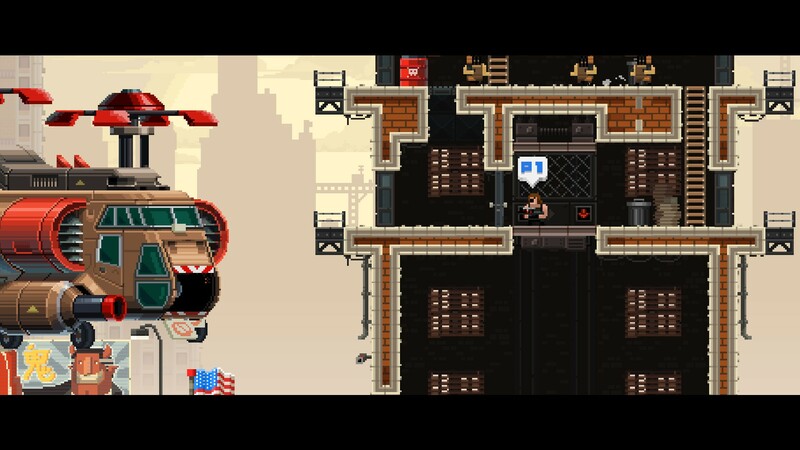 Broforce has got a retro-style pixelated visual aesthetic that’s fairly common to indie games these days, but like the best of them, it executes the style well. Specifically, the game uses what I like to call the “make every pixel count” style, where it endeavors to render things recognizably while still keeping to an insanely low effective resolution. What is so brilliant about this style and how it is applied is the level of success the artists had in reproducing iconic action heroes in this minimalist style. The cast of bro-ized characters is enormous. Classic action movie staples like the Terminator and Rambo are joined by relative newcomers like the Boondock Saints and Machete, and I could identify almost all of them at a glance even without the nametag. The enemies, as is fitting, are a bunch of generic mooks, but where they lack distinctiveness they make up for it with detail. 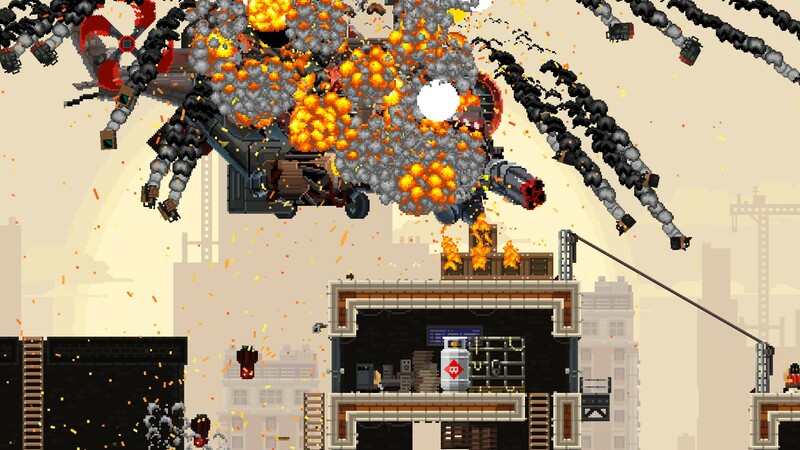 Enemies strapped with explosives throw off single-pixel sparks when they are lit. Gunmen startled by the arrival of our heroes earn a Metal Gear-esque exclamation point thought bubble. Dogs gallop, feast, and grow to a monstrous size. Heck, even a baddie unfortunate enough to be standing underneath a palm tree when you shake a coconut free will have a burst of twinkles around his head when he gets clocked. When it comes to its setting, the game isn’t hugely varied, but it isn’t all the same, either. 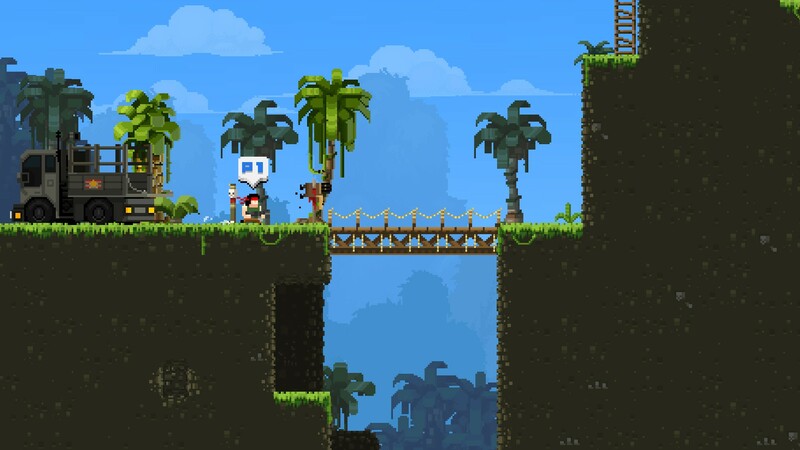 There are jungle settings and urban settings, for instance, but most of the variety from level to level is achieved with changes in structure rather than appearance. 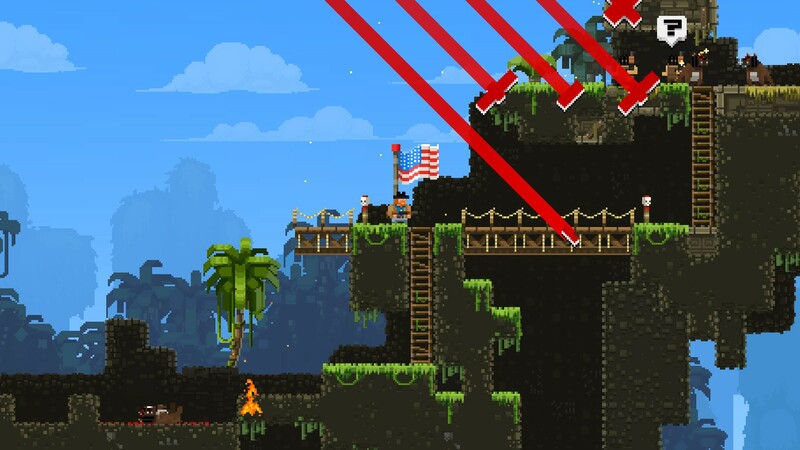 I think the best way to describe the gameplay of Broforce is KABOOM. 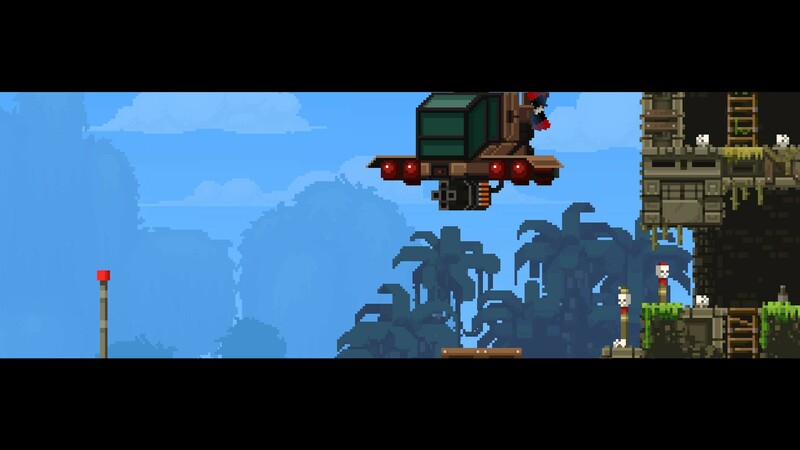 At its core, the game is a platformer, and as such it gives your player character a fair amount of mobility. You can run and jump, cling to walls with a knife, and flip up when you hit the edges of ceilings just right (though this last trick was a little tricky for me to do consistently. You can also shoot, use a knife, and toss grenades. What really gives the game massive variety, though, is that the huge list of heroic characters each has a different main attack and grenade. And when I say different, I mean different. Rambo—forgive me for not using the bro-ized names, I forgot to make note of them—is fairly standard. He fires a machine gun and hucks an explosive. Snake Plisskin, on the other hand, fires a rifle with powerful, penetrating bullets, and tosses a (character appropriate) Molotov. Characters will variously toss dynamite, fire flares, launch rockets, or even rely on punches or sword-slices. The grenades are just as varied, with air-strikes, flash bangs, guided missiles, and even the MIB neutralizer showing up. In addition to all of this is a crazy amount of little details. I mean, if you toss a grenade at a mook and hit him in the head, he’ll be stunned (then blown up, once the grenade detonates). Good stuff. I felt bad including a screenshot without an explosion, but there’s ABOUT to be an explosion, so it’s okay. As you play through a campaign, you’ll find captured bros that you can rescue. Here’s where another fun twist enters the game. Not only does rescuing a bro give you an extra life, it also switches you to the rescued bro. Since every bro plays differently, you could be forced to adapt from having the devastating charge gun of Robocop to bringing a knife to a gun fight. Another monkey wrench the game throws at you is the fact that almost everything is destructible and many things explode. Pile onto this the fact that your bro can be felled by a single bullet, as well as blown up (though not by friendly fire), crushed, or thrown off the map, and suddenly heedlessly firing your weapons can get dangerous for all involved. Some items, like propane tanks, are chain reactions waiting to happen. Shooting one of these things causes it to rocket along in the direction it’s pointing in and explode, usually igniting a bunch of nearby explosives along the way. I’ve sent one of these rocketing up off the screen only to hear some off screen explosions and have a frickin’ TRUCK fall on my head, evidently knocked from an overhead bridge. Can I just say, I hate this particular choppa. Rushing through the map will bring you past checkpoints of two types. Normal ones will provide a respawn point if you have lives left, and the more substantial ones will be your respawn point after you’ve run out of lives. 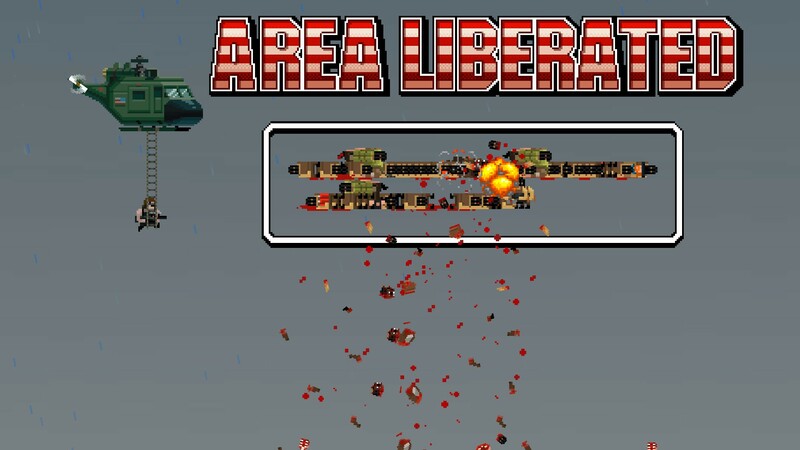 You beat each level by killing a corporate devil and “getting to da choppa.” Each run of levels ends with an appropriately epic boss, some of which will succumb to good old fashioned fire power while some require the most deadly weapon of all… cleverness. There are standard campaign modes, but also a more freeform world map mode that lets you pick your next level. If all of the stuff above sounds good, how’s this for a topper: It allows up to four players simultaneous. Imagine the absolute mayhem of having three of your closest friends blasting away the landscape and collapsing buildings on each other. It is beauty I tell you. The music is all heavy percussion and soaring guitar solos, and the sound effects consist mainly of explosions, grunts, and homer-esque yelps of fear and pain. All suit the visuals and gameplay perfectly. 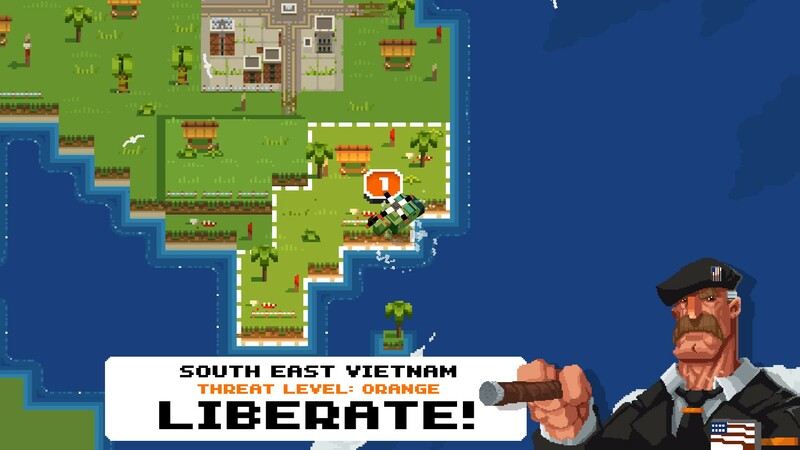 Rescue the captured bros and rescue a country by blowing up most of it. Basically the same plot as every 80’s action movie. In fact, the mindless violence and allstar cast is making me wonder why this isn’t an officially licensed Expendibles game. 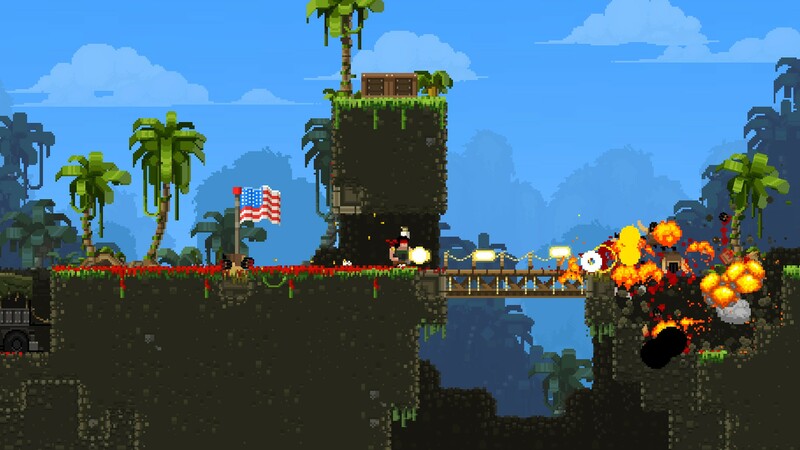 Despite being just a preview, Broforce felt incredibly polished. It was loads of fun as single player and DIABOLICAL in multiplayer. I can’t wait to see the finished product. 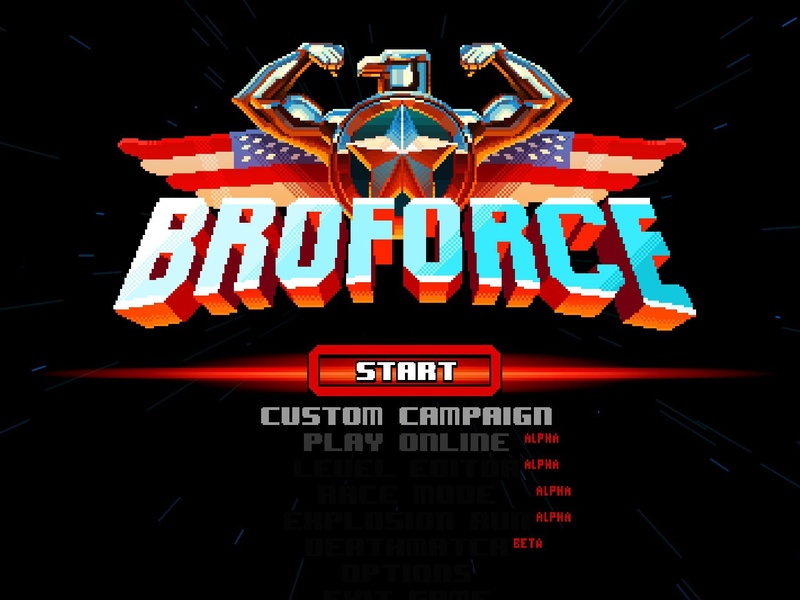 Broforce is shaping up to be a marvelously fast paced four player party game.